We are now coming to the end of our program for the year of 2016. One of our goals is to leave trainees with farm land that has been worked, planted, and growing beautiful vegetables. We have hopes that Andrez will keep his farm running and soon down the line, we will be able to aggregate vegetables together and produce larger quantities as part of our farmer's co-op called Cosecha Del Norte. 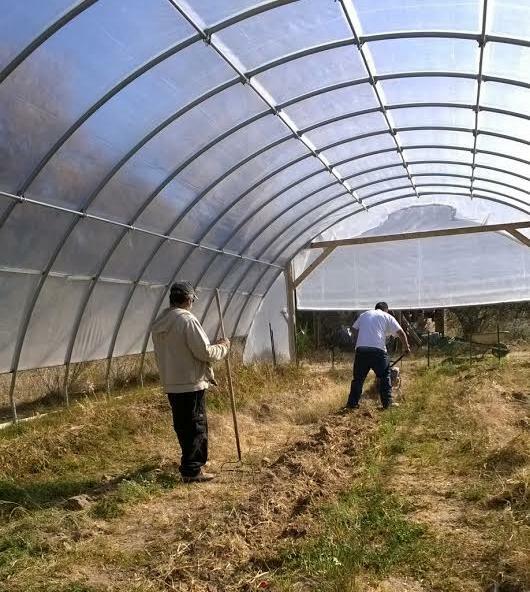 Andrez has a 30×70 hoop house along with much land. He has planted and worked his land in hopes to make it fertile, as it is a little barren. Chimayo has a lot of very sandy soil, so he has spread many cover crops for soil nutrients. However, we found when we started tilling it was not as healthy as we hoped. It was still very sandy, full of stickers, and didn't want to retain any water. We decided as a small team that we needed to give some love to this soil! We began our work and decided it would be best if we used a broad fork first, to loosen the hard, barren soil. (A broad fork is a great tool for this kind of task!) As we did so, we brought some clay to the surface in exchange for the sand. We started adding compost immediately. Andrez had his own pile of compost that he had been working on, and while it wasn't super rich, it was definitely fair. It consisted of scraps, straw, soil, potting mixes, cover crops that had been raked in, and worms which the soil didn't have. After adding a layer of compost the tilling process began. We cleaned a foot path and tilled only the beds to break up larger pieces of soil, mix the clay, sand, and compost, as well as aerate. We also added a small amount of manure to add nitrogen and help retain some water. The compost and manure will add phosphorus, nitrogen, and potassium back to the soil, all of which healthy plants and healthy soil need. 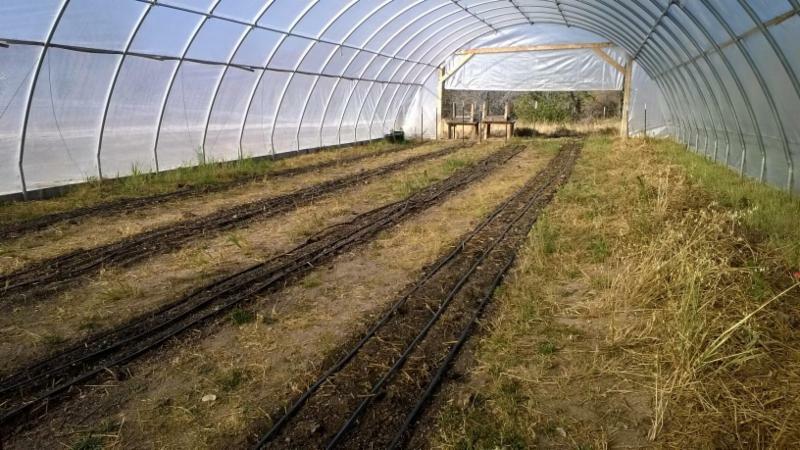 Then we planted a very nice variety of greens in his hoop house: All-star salad mix, rainbow chard, red Russian kale, and spinach- all of which do good in the colder season. We assisted in hooking up drip irrigation to his beds. It took us awhile, but the end result turned out exactly how we wanted. At the end of the month we returned to assist in planting some garlic on his land. We are so happy and excited that his seeds took, his soil is retaining moisture, and his beds are full of green veggies! This is exactly what we are working towards in the farmer training program. Donate and Support the work of the NMAA! !